With the end of another warm and loving holiday season, some of us are left with more than full hearts and happy memories. Indulging ourselves is a part of winter traditions, but a persistent tummy is cause for a variety of health issues in us, and our canine companions. After a fourteen year study, the Journal of the American Veterinary Medicine Association published their finding that an overweight dog will typically live 1.8 years less than their litter mates of an ideal weight. Battling diabetes, heart disease, high blood pressure, difficulty breathing, liver damage, cancer, joint damage, and decreased stamina can be heart breaking for a family, but we lower the risk of our companions suffering from these diseases by maintaining their waistlines. 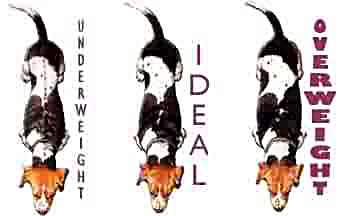 There are so many sources outlining ideal weights for dogs, but these outlines can often be vague and imprecise. Even if owning a pure bred Labrador Retriever, for instance, the range of 65-80 lbs is a significant spread and leaves plenty of room for padding our pooches. As each dog is so unique, it is best to not use comparisons, but assess your dog individually using the same techniques veterinarians use: touch and sight. When viewing your dog from above, there should be a tuck after the rib cage in their waistline. When assessing from the side, there should be this same tuck evident after the rib cage going into the hind quarters. If there is a “straight line” or any budging from the rib to the hind quarters, it is possible Fido may need to work off some problem areas. When gently petting your dog’s ribs, they should be easily felt and the skin should slide easily over the bone, as opposed to sheets of fat gliding over the ribs. Of course weight management should occur with the guidance of your veterinarian, but this is a simple and easy way to determine if there’s someone else in the family who needs a New Year’s Resolution. Whether managing your dog’s weight is new to you, or an area you have always been proactive about, the good news is management is no different from losing weight ourselves: proper diet and plenty of exercise will shed the pounds. Be sure to follow feeding guidelines outlined by the producers of Fido’s food, or your veterinarian. There has never been a more fun way to burn off extra energy and shed pounds than with friends at Fit ‘N’ Furry. Play groups are organized according to size, temperament, and play style to ensure the safest and most FUN play groups around. With web cams in all our playrooms, a proud family may look on from home while their loved one gets active and plays the day away. With play groups running seven days a week, any day is a great day to take charge of your dog’s weight, and give them a happier, healthier, and longer life!